Now at the five-star Shangri-La Hotel Qaryat Al Beri, Abu Dhabi: a blissful Summer Spacation at CHI, The Spa. 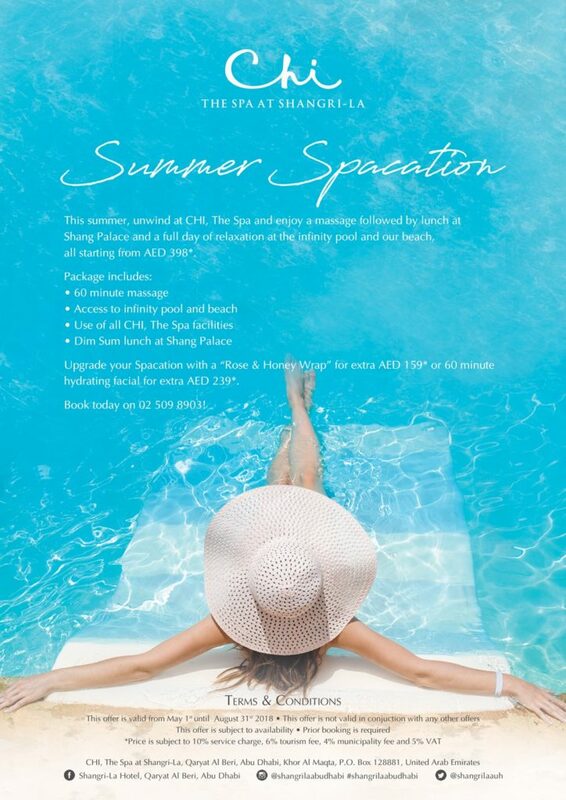 Unwind at CHI, The Spa and enjoy a 60-minutes massage followed by a Dim Sum lunch at Shang Palace and a full day of relaxation in the infinity pool and the beach, all starting from AED 398. This award-winning five-star hotel is located within the acclaimed Qaryat Al Beri complex, on a one-kilometre stretch of private beach overlooking the strait that separates Abu Dhabi Island from the mainland. The hotel is conveniently located next to a souk, a traditional Arabian market built in a modern setting offering a variety of shops under one roof.